ENB Principal Laurretta Summerscales talks to Ballet Position about her favourite roles and the current phase in the company’s history. Juliet is one of Lauretta Summerscales’ favourite roles. Juliet, that is, in the Rudolf Nureyev production of the tragic love story of Romeo and Juliet. Nureyev’s 1977 ballet on Prokofiev’s complete score is the version danced by Laurretta’s home company, English National Ballet, for whose predecessor, London Festival Ballet, Nureyev created the work. Lauretta: “You can see the transition as she turns into a woman – she realises what she wants and then she’s put into a situation where she has to choose between two sides, but she loves them both, doesn’t understand it. She’s, like, caught in a trap. Judged by many to be the balletic version of Romeo and Juliet closest to Shakespeare’s original, Nureyev’s ballet doesn’t stint on the bawdiness and violence that characterised Renaissance Verona. And he introduces some changes that intensify the dramatic effect. “This is the only version (…) where she actually sees Tybalt dead. In all the other versions that I have seen you never have the chance to show the audience your emotions, what you go through! As she gestures to signify her enthusiasm for this role, the tell-tale sparkle of diamonds flashes from the ring finger of her left hand. She is engaged to fellow Principal Yonah Acosta, with the wedding booked for the very first day of their summer holiday, post Romeo and Juliet. The natural question, then, is, would she like to establish a regular stage partnership with her life partner? ‘Feisty’ is definitely one word you would associate with Laurretta. It’s also a word that applies very much to ENB’s Director since 2012, Tamara Rojo. Does that create problems? “I find we’re both quite feisty. I think it’s more because I’m pushy and I think I annoy her sometimes, which is understandable. Big-headed is definitely not the impression Laurretta Summerscales gives. On the contrary, with her open smile and willingness to engage, she comes across as disarmingly unpretentious. Strong-willed, though; and intent on widening the range of her roles. 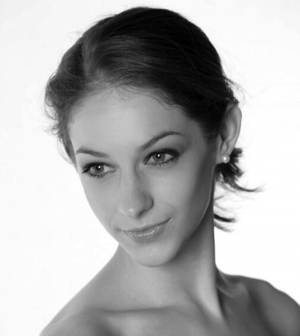 Brought into the company after only two years in the English National Ballet School, her progress up the ranks has been fairly swift, and promotion to Principal came, aged 25, in January 2016. A strong dancer with a powerful jump, and appearing taller on stage than she is in real life (at 5ft 4 or 1.62 m she’s well within a female dancer’s average), she has tended to be typecast as, say, Medora in Le Corsaire, Odille rather than Odette, Myrtha rather than Giselle. And yet, she gave a good account of Giselle in her debut in the role last Winter. Versatility has to be the name of the game under Tamara Rojo’s ambitious plans for English National Ballet. The company’s repertoire now includes work by contemporary choreographers such as Akram Khan, Russel Maliphant, Annabelle Lopez Ochoa and China’s Yabin Wang, in whose complex reading of the Medea myth, M-Dao, Laurretta starred. 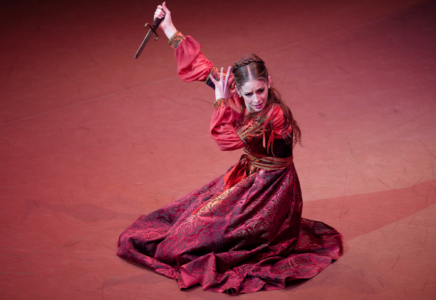 Another coup for Rojo was the acquisition of MacMillan’s seminal work, Song of the Earth, choreographed on Mahler’s haunting Das Lied von der Erde, where Laurretta would be eager to dance the central role of The Woman – though she has no idea yet whether that’ll come to pass. There is actually a lot ENB dancers don’t know about Rojo’s overall plan for the company. “Definitely La Bayadère, I’d love to do both Nikiya and Gamzatti, but I absolutely love Gamzatti, especially the last solo – it’s really difficult in the red dress, it’s beautiful! “Don Q, for sure – I feel like I can really just explode on stage. Elite Syncopations I’ve always liked because of Darcey Bussell. More immediately, Laurretta Summerscales is reprising the role of Juliet during ENB’s forthcoming stint at London’s Royal Festival Hall; and then, of course, there is the small matter of her own love story to attend to come the first day of the summer holiday and her wedding to Yonah Acosta.